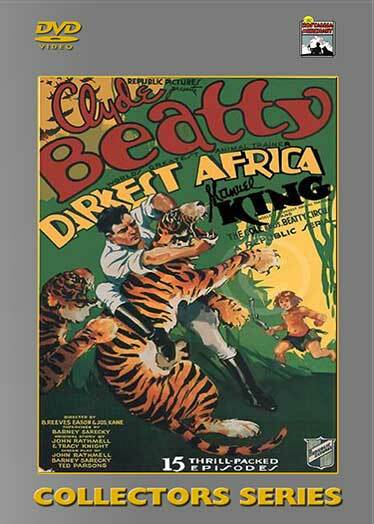 While on Safari in East Africa, Clyde Beatty runs into a loincloth wearing boy, Baru, and his pet ape Bonga. Baru reveals that he has escaped from the lost city of Joba, King Solomon’s sacred city of the Golden Bat, but that his sister, Valerie, remains there. She was found by High Priest Dagna as a child and declared to be Joba’s goddess as part of his quest for power. Her escape could cause a revolt among the city’s citizens. Clyde agrees to help Baru rescue Valerie and they set out to Joba, through the Valley of Lost Souls. Meanwhile, the unscrupulous Durkin and Craddock notice the green diamond Baru is wearing and follow them to plunder the city for similar jewels. 2 – DVD Set – 15 Chapters – 1936.